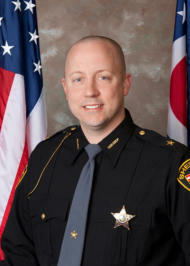 SHERIFF SCOTT M. KENT Crawford County Sheriff Our jobs are vital and a necessary part of the communities within; which we live and work. The women and men of the Sheriff's Office are proud to carry out their duties is an exemplary and professional manner. Their dedication plays a large role in helping to make Crawford County a safe place to live. I am very proud to be the Sheriff of Crawford County and to have a staff that is dedicated to their job of protecting and serving the citizens of Crawford County. When you see a cruiser on patrol, a Corrections Officer transporting a prisoner, come into or call into the office and talk to a staff member they are there for you - the citizens of Crawford County MISSION: "ENHANCING THE QUALITY OF LIFE IN CRAWFORD COUNTY BY REDUCING CRIME AND THE FEAR OF CRIME."